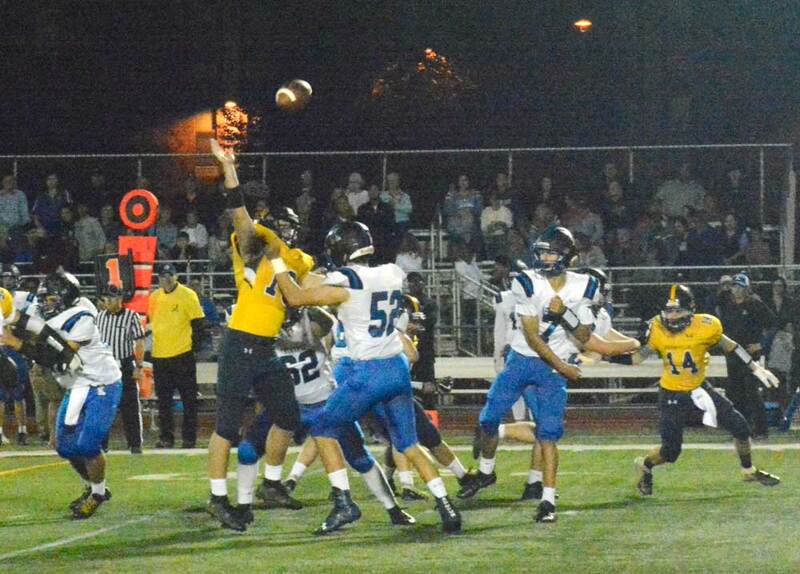 Kennett’s Sam Forte fires the ball over Unionville’s Declan Boyle, Friday night. EAST MARLBOROUGH — Since 2005, when Kennett High School revived its football team, the annual matchup with arch rival Unionville has been a one-sided affair, with the Indians winning every game. But while that streak did not end Friday night, the Blue Demons served up notice that the end is near, dropping a 10-7 decision in a key ChesMont American contest in front of a large, rowdy and spirited crowd at Unionville’s Homecoming game. Both the Indians (3-4, 3-0) and Kennett (2-5, 2-2) used stifling, dominating defense to keep the contest a nail-biter from beginning to end. Unionville — which takes on West Chester Rustin next week in a game that will likely decide the winner of the ChesMont American Division — recorded a half dozen sacks and spent much of the night tormenting Kennett QB Sam Forte. 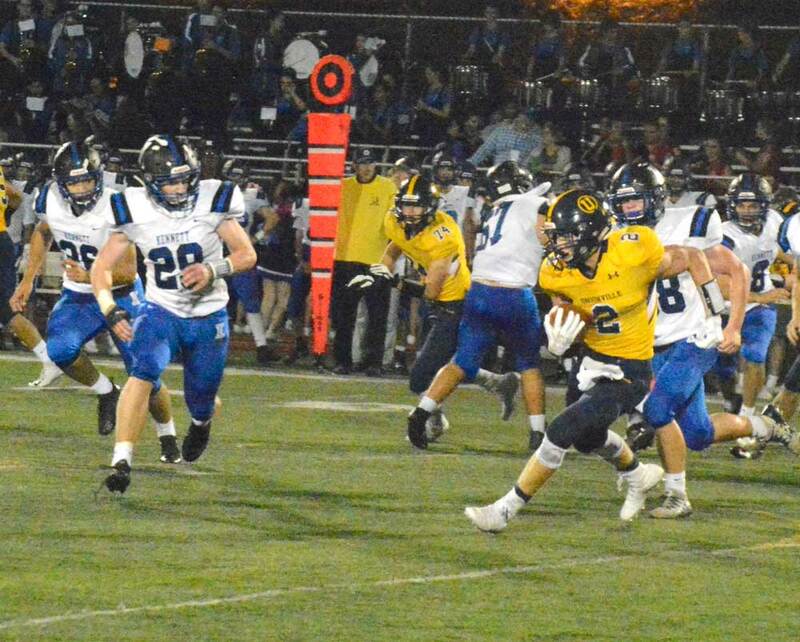 The Blue Demons were nearly as good, shutting down the Indians’ running game — other than an 80-yard TD run by senior Nick Schnaars — and kept them off the scoreboard with turnovers at crucial times. Unionville’s Nick Schnaar’s looks for running room. Schnaar’s 80-yard TD run sealed the win for Unionville. While a clear sign that Kennett is on the verge of competing, Friday’s game came up just short. “I’m so proud of our kids’ growth,” first-year Kennett Head Coach Lance Frazier said afterward. “That’s a good football team over there (Unionville), they’re well coached, I told their coach that before the game, I know they’re down because they lost some bodies, but they are a well-coached football team and I told them they are better than their record. For Unionville, the much-needed win keeps its hopes alive of winning its fourth straight ChesMont American title and of course maintaining an edge on Kennett — which shares a youth football program with Unionville. 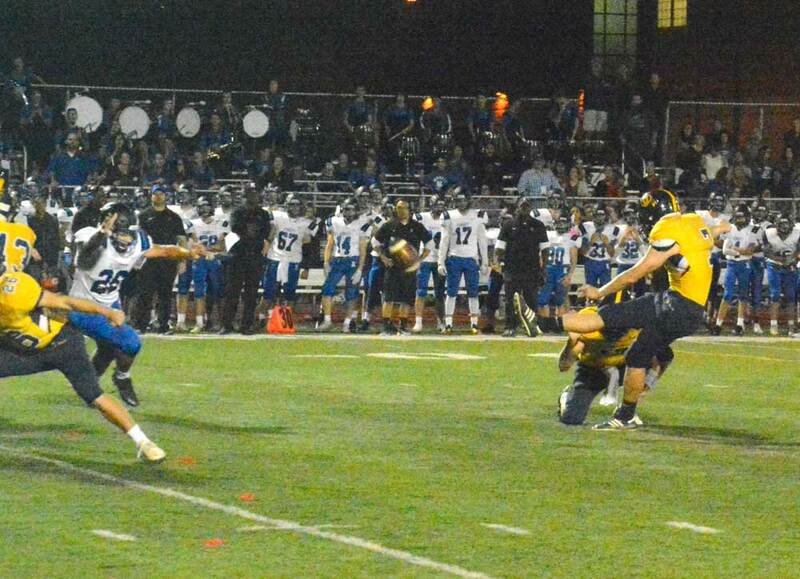 Dominic Braithwaite kicks what would prove to be a key first-half field goal for Unionville. While the 2018 season as been an on again, off again struggle (although three of Unionville’s losses came at the hands of some of the top programs in southeast Pennsylvania), once again the Rustin game is likely to prove decisive for the conference title. The Knights are coming off a strong win over Oxford, 49-13, Friday night. Still, it was all the Indians could to escape with a win. Unionville grabbed the lead in the second quarter, 3-0, on Dominic Braithwaite’s 35-yard field goal — just a few moments before the senior kicker found himself named homecoming king. And it stayed that way until the final quarter, when after Zach Lindner missed a 31-yard field goal, Schnaars found running room up the right side on the next play, racing 80 yards for a touchdown, one that proved to be the winner. The Blue Demons fought back, driving 44 yards in the closing minutes, with Forte scoring on a one-yard leaping, tumbling dive into the end zone with :38 left in the game. With Linder’s extra point, Kennett trailed just 10-7. The Indians’ Jeffrey Lang was able to get on top of the ensuing onside kick, ending any hope for a Blue Demons’ miracle.